(i) Economics (ii) Accounting (iii) Management (iv) Banking (v) Finance (vi) Finance & Banking vii) Marketing (viii) English (ix) Computer Science (x) Computer Engineering (xi) Computer Science & Engineering (xii) Physics (xiii) Chemistry (xiv) Mathematics (xv) Statistics (xvi) Agricultural Economics (xvii) Health Economics. b. Age : Not over 30 years as on 18-08-2017.
c. Salary: There will be a 01 (one) year period of probation/training which will start from the date of joining in the Bank’s service and during the probation period a remuneration will be paid @ Tk. 35,000/- (Taka thirty five thousand) only (consolidated) per month. After successful completion of the period of probation, the Probationary Officers will be confirmed as Senior Officer in the scale of pay of Tk.20000-1600X2-23200-2200X15-56200/- with other allowances & benefits as admissible in the grade. d. The selected candidates will have to give an undertaking to the effect that he/she will serve in the bank for a minimum period of 05 (five) years. e. Computer literacy is a must for this position. a. Academic Qualifications :- Graduation from any recognized Educational Institution. There must be at least 01 (one) Second Division/class in the Board and University examinations. d. Assistant Officer (Cash) with other allowances/benefits as admissible in the grade. e. Period of probation: There will be a 01 (one) year period of probation/training which will start from the date of joining in the Bank’s service. After successful completion of the probation period the recruited Officer will be confirmed as Assistant Officer (Cash). Only short listed candidates will be notified for the written test through our Website and by sending SMS at their respective mobiles . The short list will be prepared by the Bank by taking a MCQ Test of the candidates from whom the applications will be received by it in response to its advertisements. a. Computer literacy is a must for all the positions. b. Persuasion/Influence/Recommendation/Canvassing in any form will make the candidate liable for rejection of his/her application. c. The candidate who is in job elsewhere needs to apply through proper channel. d. The candidate who is not willing to serve anywhere in Bangladesh needs not to apply. f. allowed to apply for the post of Assistant Officer (Cash) and vice-versa. g. There will be no scope of cadre change from Cash to General for any employee who will be appointed under this recruitment process. a. Academic Qualifications wiil be measured against criteria mentioned in Job Circular. b. Mozilla Firefox, Internet Explorer 7.0 & above is recommended. c. Select dates from calender. d. Image size should not exceed 30KB and Image extension must be of .jpg format. e. Scanned signature size should not exceed 20KB and Image extension must be of .jpg format. f. All * marked fields in the Application Form are mandatory . g. Please print and preserve both of Confirmation Letter & Online Application Form after submission of the application. h. Computer literacy is must for this position. i. You are requested to keep your password in mind. The Online Application Process consists of three phases. First of all, clicking APPLY NOW Applicant will be redirected to Online Application Form to fill in (Step-1). After successful submission of this form you will be forwarded to Confirmation Page with a Track No. Print this page and preserve it (Step-2). However, Applicant will see a link View Online Application at the left bottom corner of the Confirmation Page. Last of all, please follow the link to view the Online Application Form and print this one (Step-3). Applicant can view and print this online application form (if it requires) using EARCH option. Uttara Bank Limited admit card visit official website www.uttarabank-bd.com. Bank authority will be notify the applicant about exam date and admit card download by Mobile Phone SMS and E-mail. Uttara Bank Limited seat plan visit official website www.uttarabank-bd.com. Bank authority will be notify the applicant about exam seat plan download by Mobile Phone SMS and E-mail. 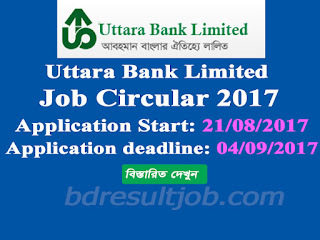 Tags: Uttara Bank Limited Job Circular, Uttara Bank Limited Admit Card dwonload Uttara Bank Limited Seat Plan, Uttara Bank Limited Exam Result . 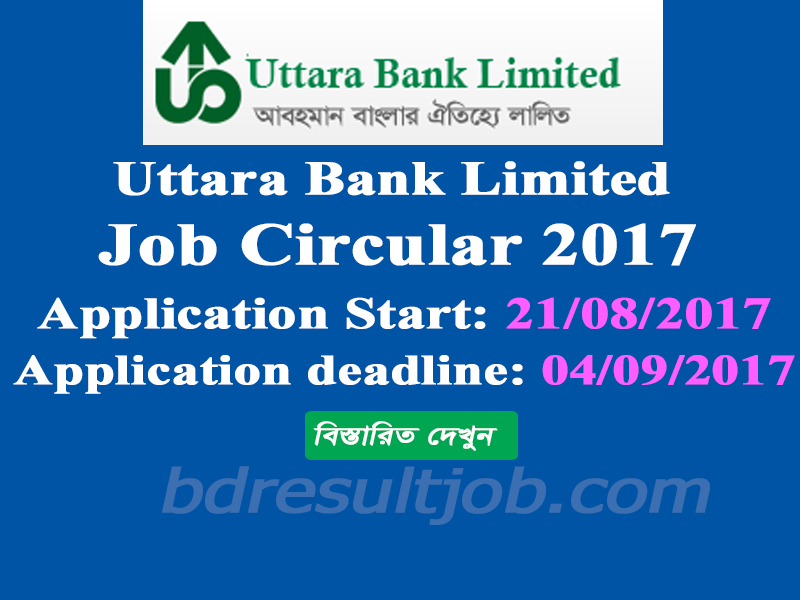 Uttara Bank Limited Probationary Officer Job Circular 2017, Uttara Bank Limited Job Circular, Uttara Bank Limited Admit Card dwonload Uttara Bank Limited Seat Plan, Uttara Bank Limited Exam Result .